Western Digital has finally unveiled its first 6TB HDD as part of its family of products that focus exclusively on NAS (network attached storage). 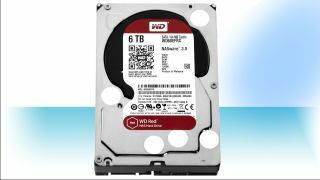 The WD Red range will welcome a 5TB and 6TB hard drive and a new subset, WD Red Pro, will provide SKUs to address the medium-to-large NAS market exclusively. The 6TB model comes with a three-year warranty, an internal transfer rate of 175MBps and a 64MB cache as well as WD's new NASware 3.0 firmware. Both Seagate and HGST, a subsidiary of Western Digital, have already launched 6TB models, which took over 4TB as the biggest storage capacity on the market. However, WD trumps the two by offering a cheaper model (you can get the 6TB model for as little as £212 - about $380, AUD$410), significantly less than the competition. More importantly, its cost per GB is only about 50% higher than the average price of 3TB non-NAS tweaked hard disk drives which makes it a bargain for those trying to improve their NAS capacity without resorting to swapping the NAS enclosure altogether. HGST employs seven platters while Seagate has a 6-platter design to reach 6TB. WD uses 1.2TB platters, setting a new areal density record, at least in shipped drives. Western Digital has also confirmed that 5TB and 6TB SKUs will also be added to its Green range with an even lower price range.